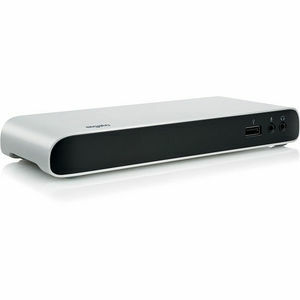 Elgato Thunderbolt™ 3 Dock enables you to connect everything to your computer at once. Use only one cable to drive dual displays, network at full speed, charge your MacBook Pro and more - and harness the full potential of USB-C.
Providing up to 85 W of power, Elgato Thunderbolt 3 Dock charges your MacBook Pro or Windows notebook via the same cable you use to connect it. Gone are the days of lugging around your power brick, or running out of juice if you forgot to pack it. Your USB devices will also benefit from superior power management: USB-C accessories are always properly powered with up to 15 W, while the built-in USB 3.0 ports can even charge your iPad, boost your iPhone charge, or power your Apple SuperDrive. And don't think twice if you need to shut down or head out - Elgato Thunderbolt 3 Dock will charge your devices regardless of whether your computer is off or disconnected.